race day – Pump Those Crazy Legs! 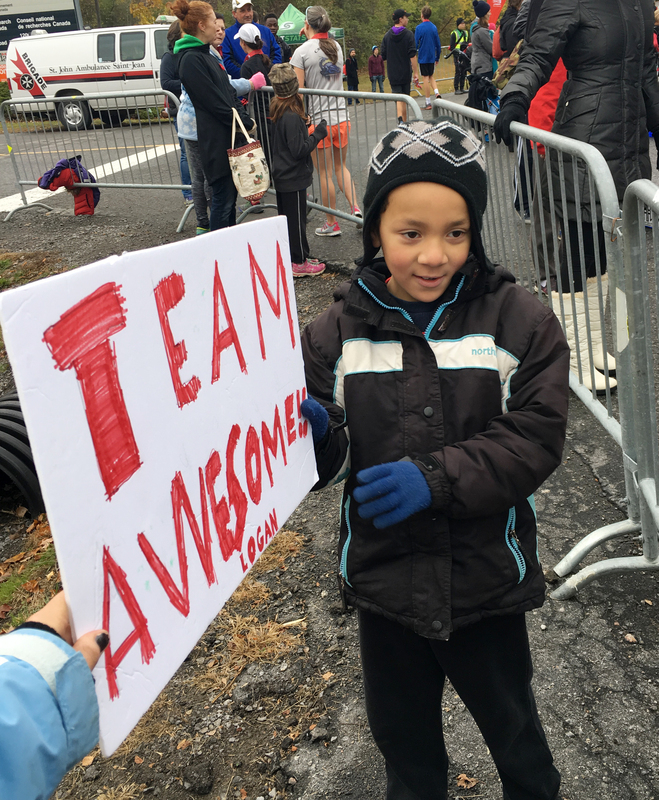 The night before, Logan excitedly made a sign to hold while we cheered on the 5k and 10k runners. I wanted him to be there to experience the whole race-day vibe, so this was a great idea! 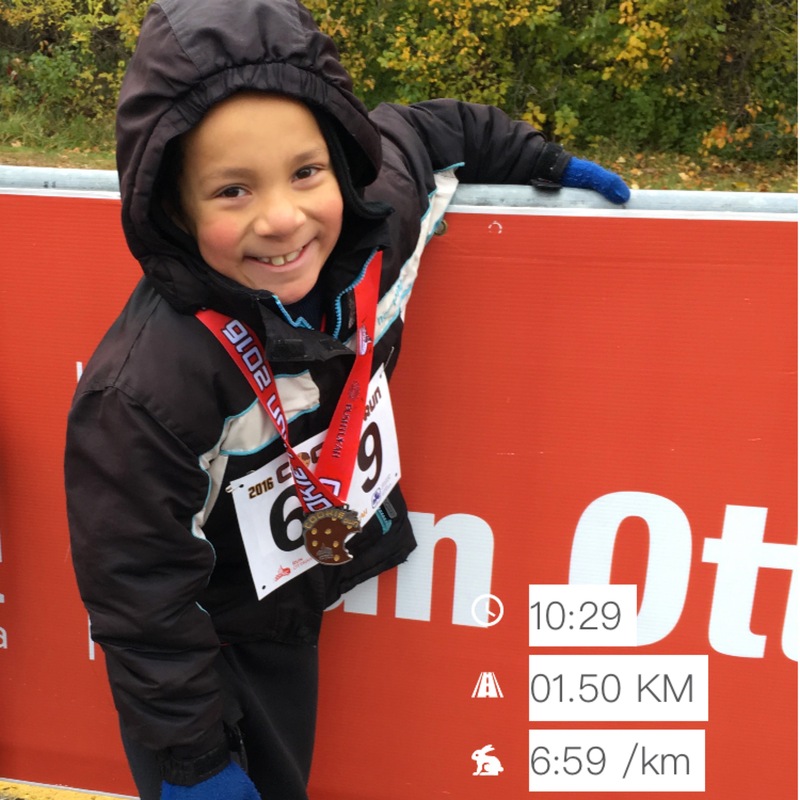 The event wrapped up with the kids 1.5k run. Jake was not too thrilled about running when the time came, but Logan really surprised me by saying that he was going to go for it and sprinted off while I stayed behind to help Jake through the course. Jake did manage to pick up speed when he realized he didn’t want to finish last – taking off while looking over his shoulder, haha. He’s had this stubborn cough that’s been hanging on for about a month now, so he was really quite a trooper. I’m so proud of Logan and Jake, they did so well! 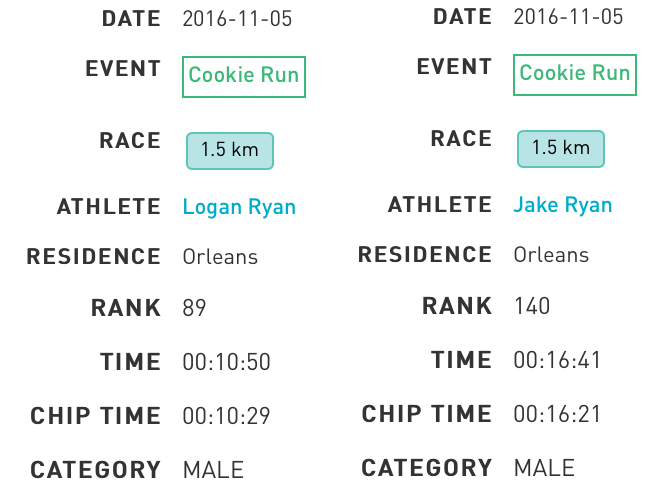 I am so amazed by Logan’s improvements as a runner too, already! This is definitely a race that I will sign us up for again next year! Somewhere in the back my mind I thought that maybe I could finish out the running season with a half-marathon. I don’t know what form of logic drew me to this conclusion. I had spent the last half of summer training specifically for faster 5k races, and so I hadn’t been getting as much distance training in – save for a couple sad attempts at exceeding 16k without dying. Then after the Army Run I caught the flu, which had me completely non-functional for a good 8 days. That left me with approximately 15 days to get my legs used to running again, and then adding on the extra distance training to tackle my first ever 21.1k. Yeah, should be a piece of cake. Even signing up for the 10k, I didn’t expect this to be a PB race for me due to the recent setbacks in my training. So I went out with the goal of just having fun. The thrill of one last race before winter sets in! Stittsville is.. a heck of a long way out from where I live. In Friday’s rush hour it was even worse. In hindsight, I should probably have waited until the actual day of the race to collect my bib for this one, as it was a lot of driving for me two days in a row. Particularly when I am so needed here at home that my every outing causes a huge inconvenience to our household. After an impromptu selfie for Instagram, it was time to make my way out to the race grounds! The walk only took a minute, and there wasn’t much of a wait for the porta-potties either (I don’t drink before races but somehow always have to pee), it was great! I had about 25 minutes until the race began, and so I followed the crowd heading along a path through the wilderness, which lead me to the starting line. As I said, I was not expecting exceptional greatness from myself this race, and so I decided to give it my all, but to also have fun with it. Here’s a photo that was taken of me recording video on my phone when we left the starting line, haha! I took random selfies and didn’t really focus too much on my watch. For that reason I ended up missing my first walking break after 10 minutes, but was able to keep going until the next one. When I felt like I was going too fast I would find people running at a steady manageable pace and just run behind them. Even with my 10:1 walking breaks I would keep catching up to the same groups of people running continuous! Zoomphoto is a great Canadian-based photography company that I would highly recommend for all races! Their photographers were so nice, cheering on the runners and even calling out names as they caught a glimpse of our bibs. They definitely brought a smile to my face during this race, and captured many great shots that we will treasure forever! During the last 4 kilometres of the race I was amazed when I looked down at my watch to see that I was maintaining a 6:30min/km pace! It was at this point I decided to really push myself/maintain this to the finish – even though the 55 minute, 1 hour, and 1:10 finish time pace bunnies had already long since gone by. Occasionally I would need extra walking breaks, but I didn’t linger in them. And when I saw the finish line I just went for it with a burst of energy that came out of who knows where!! I couldn’t even feel my legs and just hoped I wouldn’t fall on my face crossing the finish line, haha! I couldn’t believe my eyes when my Garmin congratulated me on my new record-breaking 10k (which still turned out to be a bit slower than the actual chip time because I had started it before crossing the official start line). A police officer placed the giant medal around my neck. I was beaming. Never in a million years did I expect to run my best 10k that day! And what a great race! I would love to do it again next year! 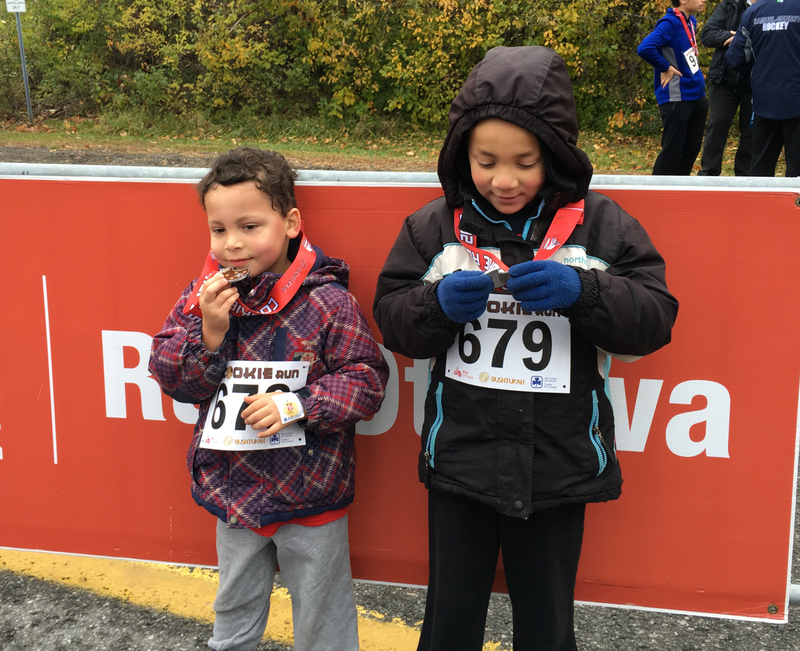 ..However, I would also really love to do the Scotiabank Toronto Waterfront Marathon as well, which many of my online running buddies from Run Ottawa’s Team Awesome attended. Unfortunately STWM and 9RunRun fell on the same weekend this year, which may mean they will again next year.. I just have a feeling that all of these big races are going to be extra special next year in celebration of Canada’s 150th anniversary, and so just this once I would love to be a part of all that excitement if I can!